I’m back with more Minoru pictures! 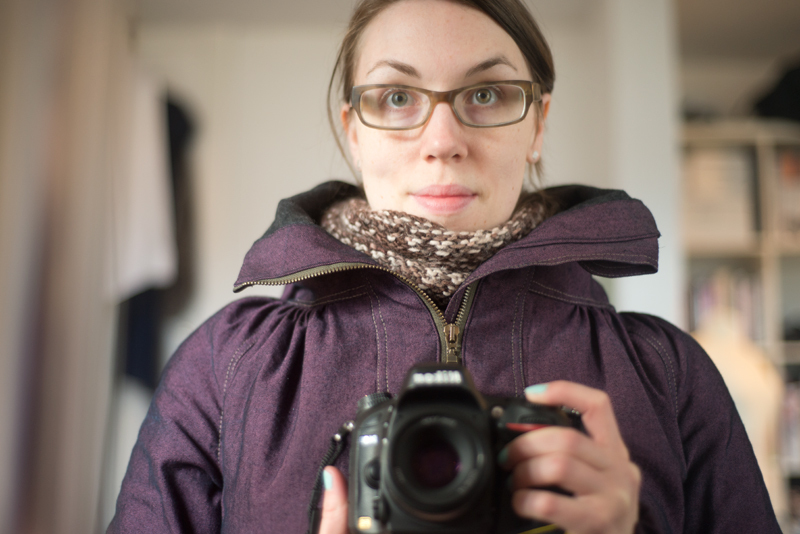 First off, look at how nicely this cherry blossom cowl I made a long while back matches my new jacket? I didn’t even notice it until I randomly paired them one day, but I guess it pays off to have some preferred colors in sewing and crafting! 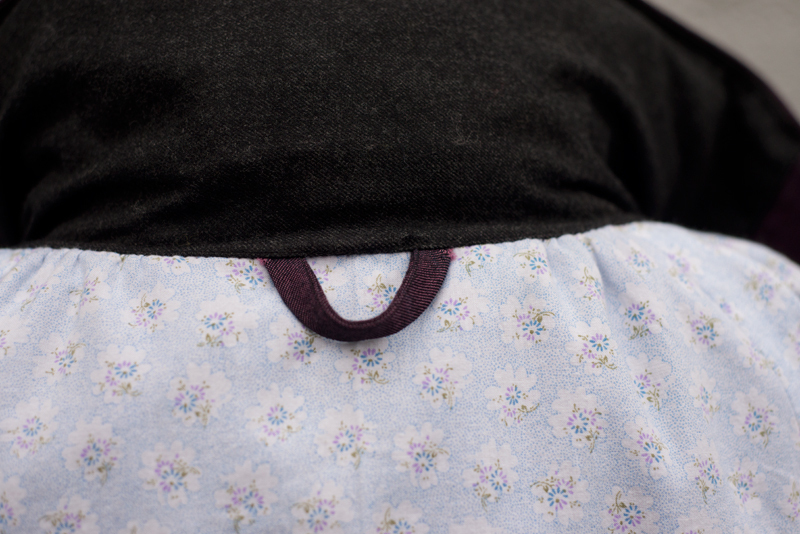 (By the way – check out how nicely Tasia’s newly knitted sweater matches her newly made skirt! She’s recently blogged about how her preferred color is orange). 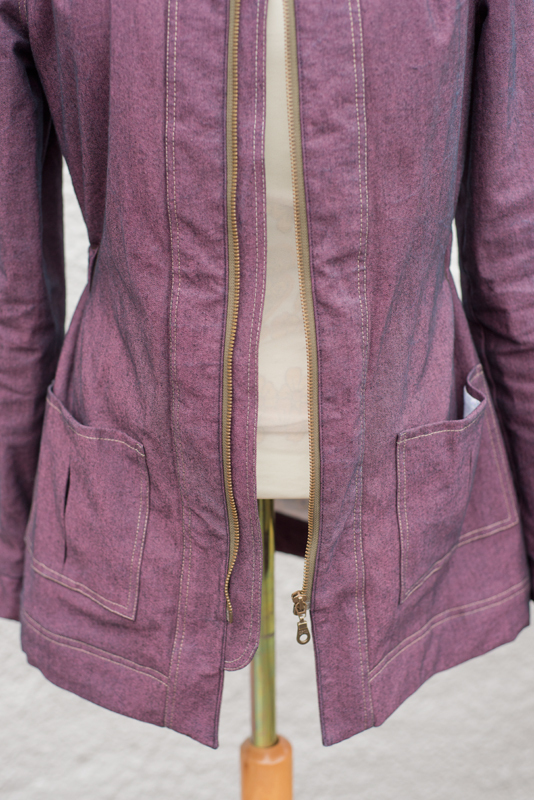 I had so many details and small changes I wanted to share about this jacket, and I figured two separate post would be better to avoid picture overload. Still, I have 14 pictures here, so it’s still photo-heavy! I love the look of the zipper guard! I think it adds a professional looking touch to the jacket, and it does protect my clothes a bit from the zipper when I do up the jacket. 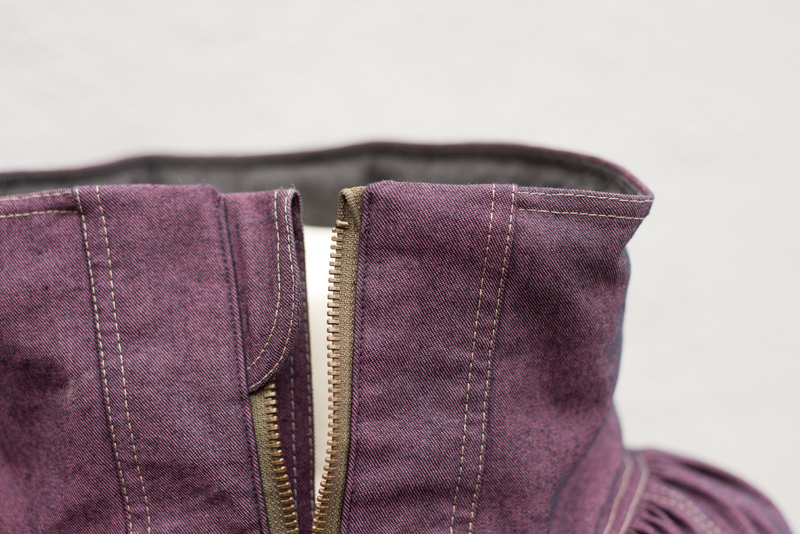 Another thing I did differently from the pattern and instructions was how I sewed the top of the zipper. I did it according to the pattern first, but found it so lumpy and awkward that I knew it would irritate me forever. 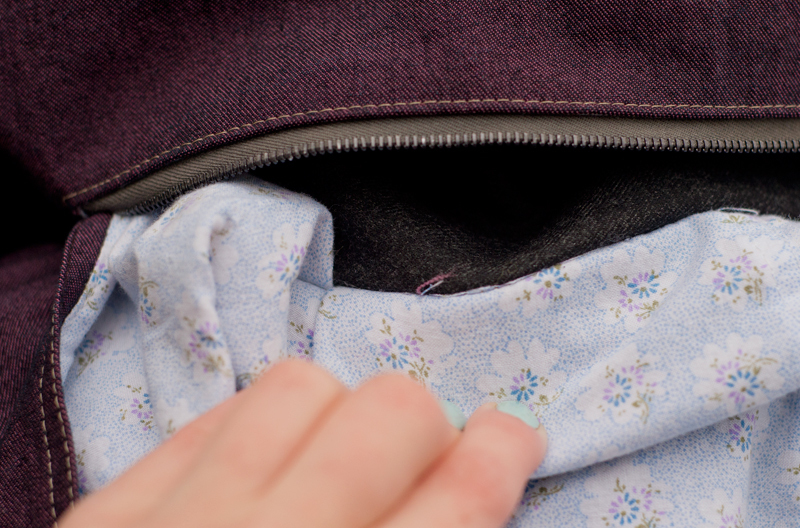 I played around with it and decided to not attach the top of the zipper tape in the top collar seam, but instead fold the excess down and just nestle it against the top collar seam. I think it came out great, very nice and flat – except that I folded the zippertape to the front instead of the back! At first I was annoyed, but then I decided it looked perfectly neat as is, and doesn’t necessarily look wrong. So there. As I’ve mentioned several places, one of the reasons I spent about 2 years (!) 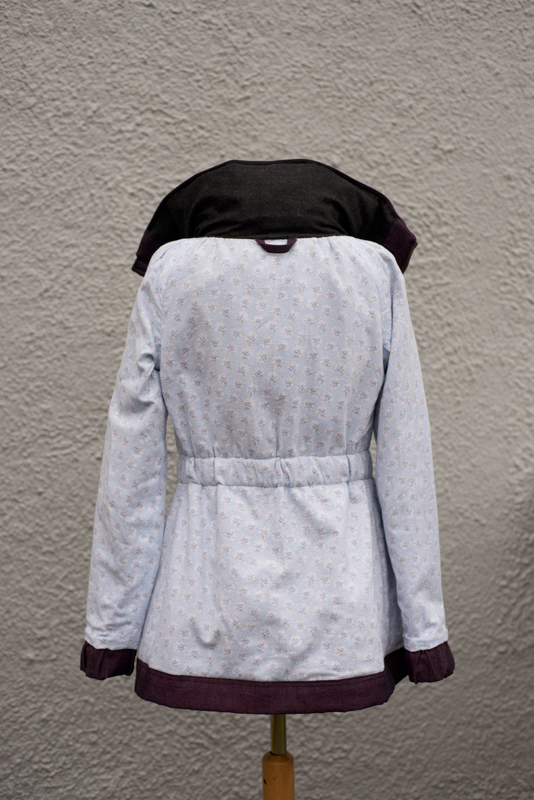 on this jacket were these extra things I wanted to add, in addition to the pattern. I spent a ridiculous time on the pockets for example. 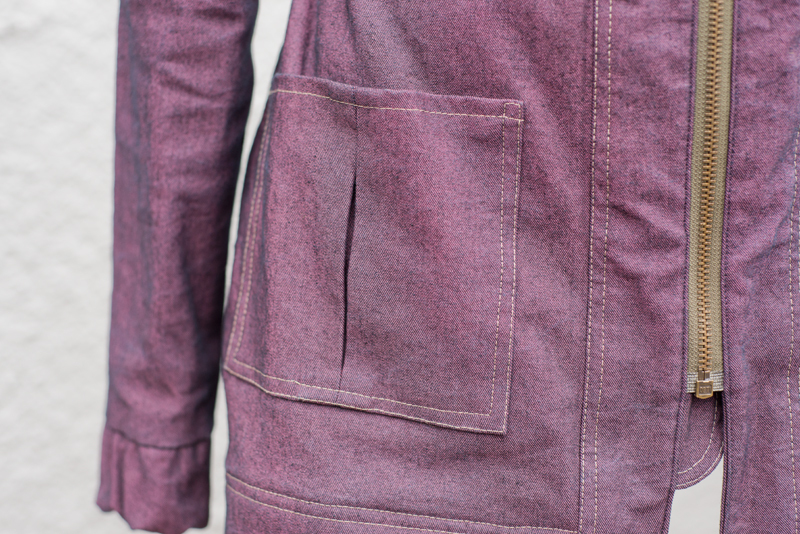 I’d seen the inseam pocket add-ons around the web, but they didn’t feel right, so I landed on a patch pocket instead. I wanted to add some volume so I had some room to put things in the pockets, and I thought a pleat would look cool. I also wanted to line them , but not have raw edges – a lot of thought went into the construction of that step! I ended up folding under the main fabric, and slipstitching the lining fabric flat, very close to the folded outside pocket edge. This way the raw edge would be completely enclosed between the two rows of topstitching that I did. 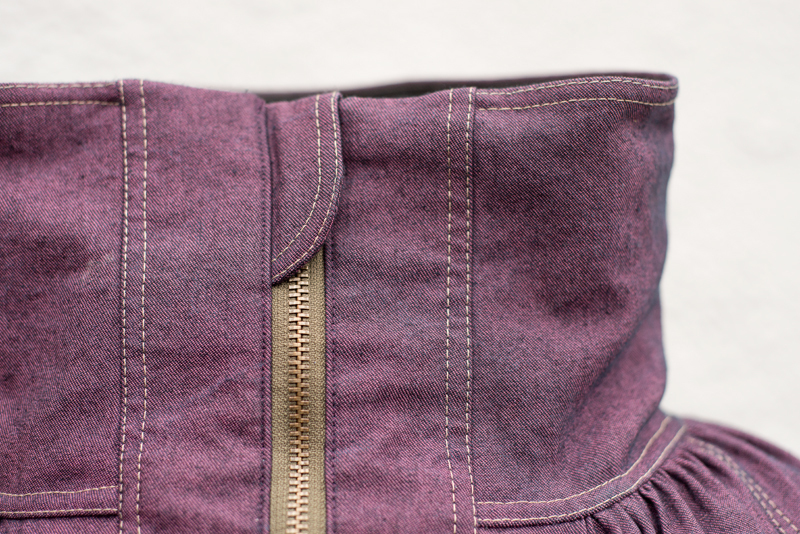 Speaking of topstitching – I would not do contrasting topstitching if you didn’t feel very confident in your topstitching skills! I have a magic edgestitch sewing foot that does most of the work for me, and topstitching is usually a breeze. I struggled with a couple of the seams here, like the bottom collar seam, and the hem for starters. 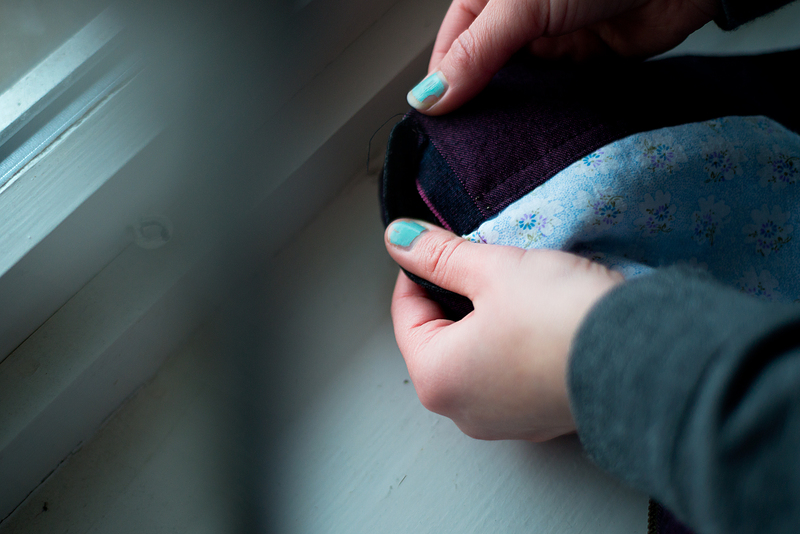 I think part of the reason I did, was from choices I made – the fabric is a little too thick to comfortably handle all those gathers, and the fact that I trimmed down the seam allowance severely made it more difficult to properly align the seams. It’s coming apart at the outer edges! No wonder – the entire weight of the jacket is hanging on that little loop. It hasn’t really gotten much worse in the couple of weeks of wear I’ve put it through, so maybe it’ll just stay that way. Regardless! Don’t do that. I still think I would prefer a collar that doesn’t have raw edges on the inside, but I would either use very wide topstitching so I didn’t have to trim down the seam allowance so much, or I would bind the seam allowances in bias tape or something. The bottom would have to be bound in two separate rows, so to speak (the shell fabric seams, and the lining seams by themselves), and that could get a little lumpy. I don’t think any of the solutions are really excellent, so again – I totally understand why this isn’t part of the instructions, it just gets really complicated! The lining is an old kid’s duvet cover – I don’t know if I’m just imagining it, but I’d like to think this is something I used when I was a kid. It does make it feel a little more special, to have a fabric with significance as the lining. As I mentioned in the previous post, I interlined the front and back pieces with some wool flannel to make it warmer. I thought about doing the sleeves too, but that really would have been too bulky to be comfortable (I checked!). 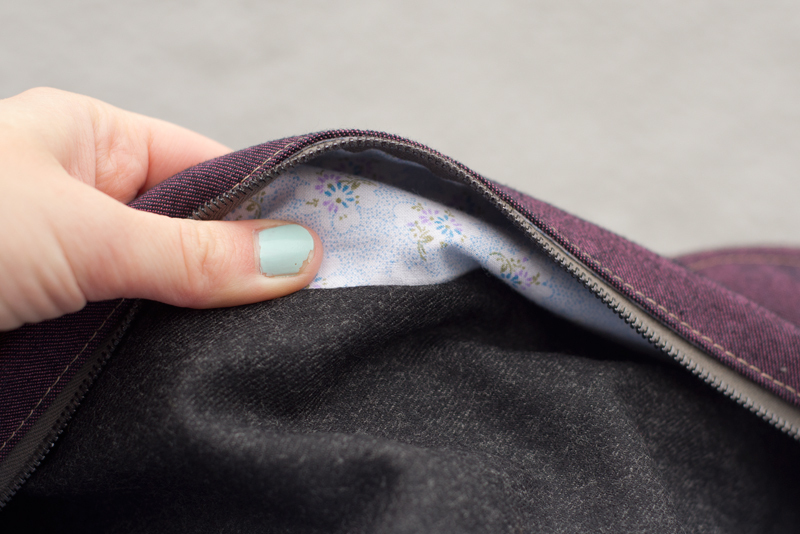 It’s the same lining fabric for the sleeves as the rest, and yes – they aren’t as easy and slippery as a traditional lining, but really, it has not been an issue getting the jacket on and off. I used a dark grey wool flannel for the collar to have a softer fabric against the skin, and I’m quite happy with that. I think I first saw Kristen do that on her Minoru (which, by the way, is an awesome English countryside version with elbow patches and flannel and a great color). I like having flannel there, and I also put some piping between the plackets and the lining in the same flannel fabric, just because I could! 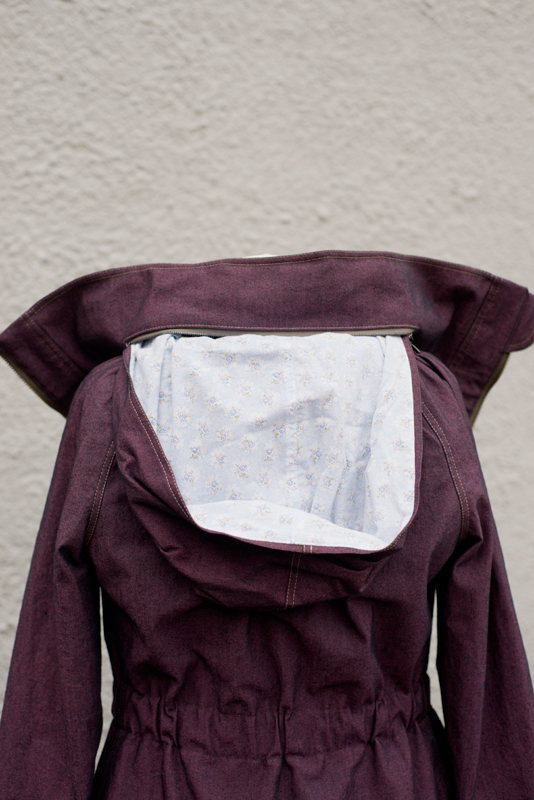 The inner flannel collar is quite floppy when the hood is out and about. 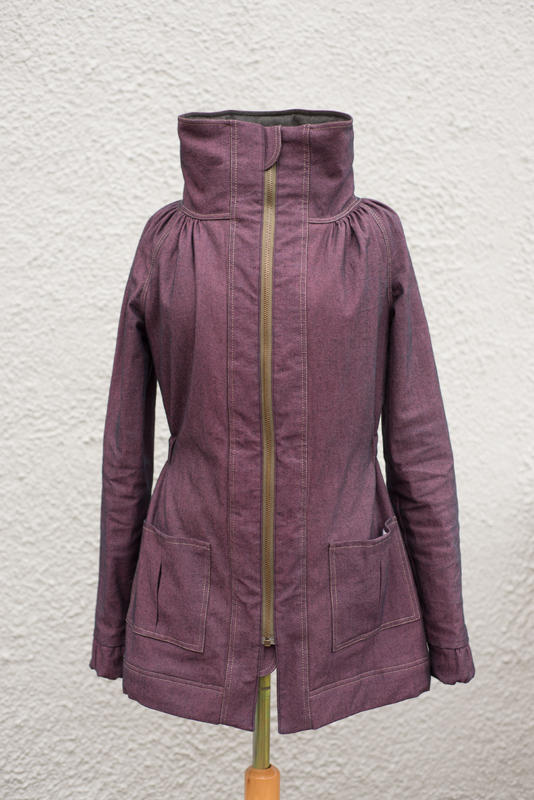 It would benefit from interfacing, but then again – it would be more bulky when the hood is in the collar. I think the hood and collar is a real balancing act. If I had a lighter fabric I would have interfaced the inner collar for structure, and if I had a heavier fabric I would avoid lining anything (including the hood) to reduce bulk. After mentioning I had used the “wrong” side of the fabric, I got some questions about what the right side looks like. 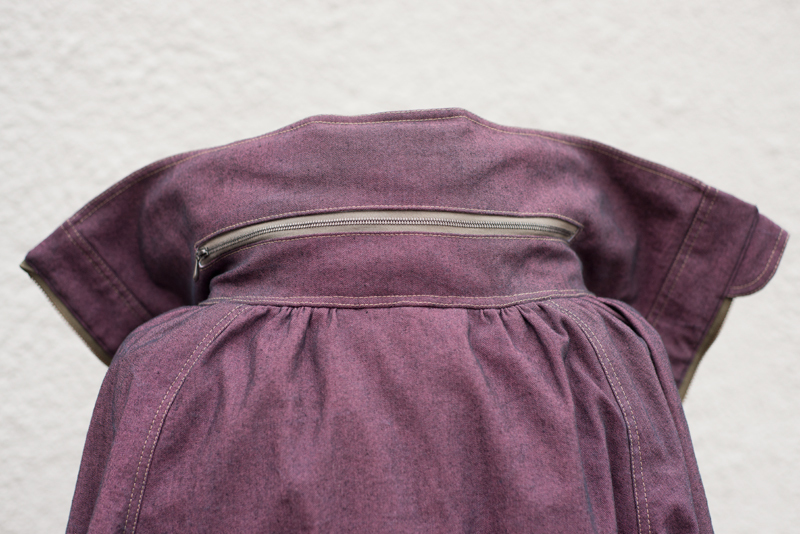 Luckily for you, I hadn’t actually completely finished the jacket with the last slipstitching step, so I’ve included a peek at the hem, where you can see a bit of the selvage – which looks the same as the “right” side. 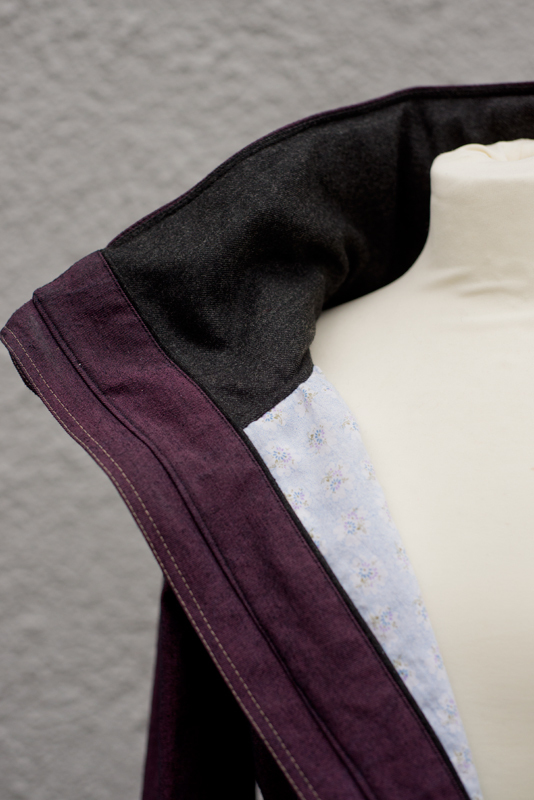 The bit of pink from the fraying edge is mixing with the dark blue-black, and making the purple color somehow. I still much prefer the purple side, I think it is much more interesting and rich looking! In conclusion, I am thrilled with this jacket. I’m glad I took the time to do things thoroughly, and add touches I knew I’d be happy with. It’s a win! Thank you Donna! I’ve grown to really like the look of it! I hadn’t thought about it mirroring the top of the other side, but you’re right. I have a pattern I’m designing with a similar construction for the zipper, and it’ll have the excess folded to the front like this. First I saw it as a compromise, but now it might as well be a design element! I love all the extra details. The colour is lovely too. Tus manos son de oro. Desde Palma de Mallorca. España. Hi! 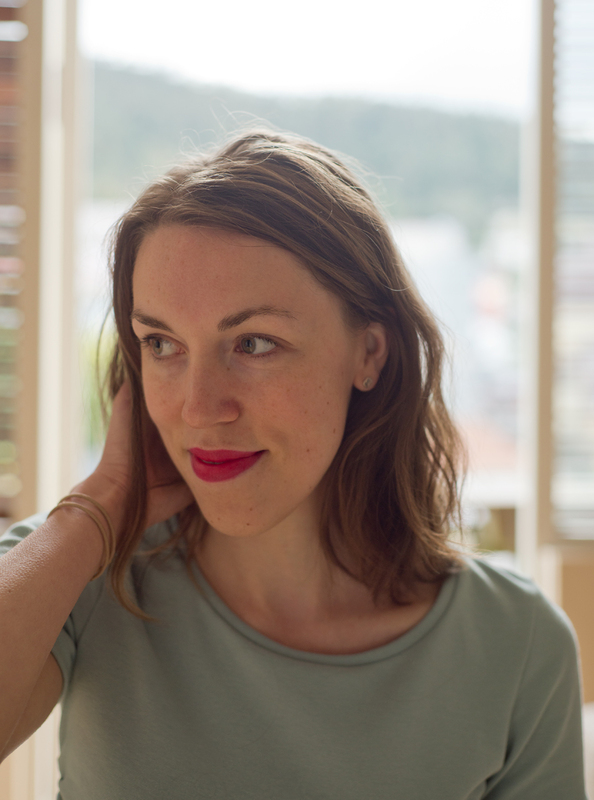 I'm Birgitte, and I make things. Usually I sew clothes for myself, or knit something from stash yarn, but I like *making things*. I am a teacher, and I've done costume and custom sewing work which you can take a look at on the portfolio page. Nothing like dim winter days to photograph your grey wool makes! 😄 Thankfully the inside of this @deer_and_doe_patterns #ddnenuphar is as cheery as can be. I wrote lots of words on the blog about how I made quite a few changes, as I seem to always do. Like adding a lining! Which I cut too short! As one does on a sunny Sunday.